Biopharmaceutical products must be free of host cell proteins (HCPs) for approval by authorities such as the FDA and EMA. ELISAs are commonly used for HCP determination and regulatory authorities ask for clear and manifest proof that the antibodies used in the HCP ELISA are fit for purpose. 2D analysis may contribute as an orthogonal method to characterizing HCP populations and is requested by authorities for demonstration of an antibody's suitability for measuring HCP contamination in a specific process. The visualization of sample proteins on a 2D gel is used for characterizing intermediates of a downstream purification process and for monitoring HCP contamination. 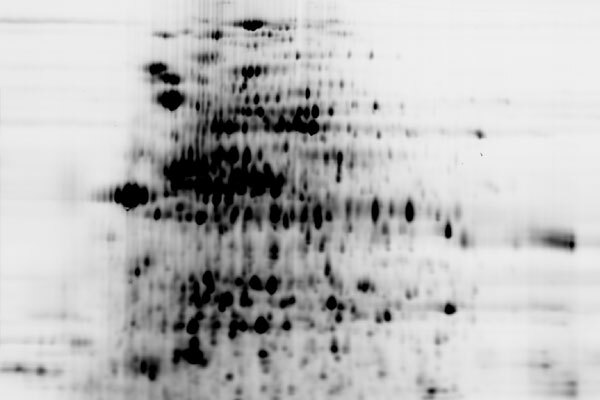 BioGenes uses up-to-date 2D electrophoresis instrumentation, including the horizontal flat-bed SDS-PAGE, to enable the highest resolution of sample protein spots, even for low molecular weight protein species. BioGenes offers a variety of staining methods for each purpose including fluorescent minimal labeling, Coomassie, silver staining and sensitive fluorescent total protein staining. Example of a fluorescent total protein pattern of an E. coli derived HCP sample.